Planning a children's party? There's always plenty to think of and organise, so why not take some of the stress out of the occasion with a Party Things 2 Go voucher? Whether you need a whole bundle of balloons for a Disney party or a job lot of pre-filled party bags for the kids to take home at the end of the day, a Party Things 2 Go discount code can help you make big savings while you shop. We all know that planning a party for babies, children or toddlers can be a stressful and time-consuming activity. There's always so much to think about, from the food and the music to the games and entertainment. Luckily, there's now a place you can go to take a huge weight of your mind – Party Things 2 Go. At Party Things 2 Go you'll find a huge range of party supplies that are perfect for any occasion – all delivered to your doorstep in the quickest possible time. Planning a baby shower or a baby's first birthday party? At Party Things 2 Go you'll find everything from themed paper plates and balloons to full first birthday party kits containing invites, decorations and more. Stumped for ideas for a children's birthday party? Party Things 2 Go has heaps of inspiration for the perfect celebration. They've got lots of themed party kits for throwing the perfect Disney, pirate or princess party, as well as accessories to fit ever-popular themes like dinosaurs, butterflies, monsters, under the sea and more. On top of full party kits you can purchase separate party supplies like cups and hats, pinatas, dressing up kits, party bags and party bag fillers and much more. At Party Things 2 Go they understand that being a parent can often mean you are strapped for cash. That's why all of their products are available at an amazingly affordable prices. Party bag fillers start at just 4p, with filled party bags from only 99p – so no matter how tight a budget you're on, everyone will have something to take home at the end of the day. They also offer speedy delivery that's perfect for last minute preparations and planning, with many products available for delivery within 2 days. Want to get celebrating with Party Things 2 Go? With a Party Things 2 Go voucher you can get great deals on everything you need to host a party to remember. Whether you want balloons bedecked with your son or daughter's favourite character or some more practical catering supplies, Party Things 2 Go voucher codes will help you save money while you shop. Browse our website until you find a Party Things 2 Go voucher, then navigate to their website to begin shopping. Enter your Party Things 2 Go discount code in the box provided and click 'Apply coupon'. Enjoyed shopping for children's party supplies at Party Things 2 Go? Why not check out great deals on toys at the Disney Store or parenting essentials at Mothercare? Or, if these aren't right for you, you'll find plenty more stores to browse in our Baby, Kids and Toys section. Enter your Party Things 2 Go voucher in the box provided and click 'Apply coupon'. Enter your address details for a delivery quote. Standard UK delivery is free on all orders over £50. For orders under £50, standard delivery is between £2.50 and £3.99. If you need to return a product for any reason to Party Things 2 Go, you can do so by referring to the online Orders and Returns form here. Need to contact the team at Party Things 2 Go? Whether you have a question about your order, want to find out more about the range of party supplies on offer or simply want to know how you could save money with Party Things 2 Go vouchers, you can contact the Customer Services department by telephoning 01903 724957. 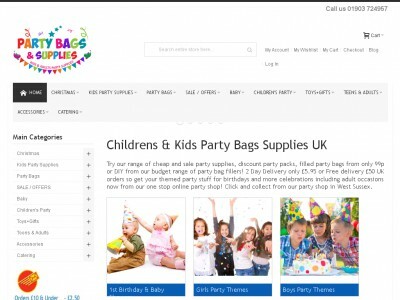 Want to find out more about the great products on offer at Party Things 2 Go? Why not check out their social media pages? You'll find lots of exclusive content including party hints and tips, competitions, crafty how-tos and much more. You can also use these pages to find out more about saving money with a Party Things 2 Go voucher. Don’t forget to check them regularly, as you can never be sure when a free Party Things 2 Go discount code might be waiting for you! Buy now online at www.partybagsandsupplies.co.uk. If you’re looking for party supplies for kids, then partythings2go.co.uk will be the first and last place to pick up everythig you need. Here you’ll find products for all ranges that are guaranteed to leave an impression on every child in the room, which include toys and gifts as well! Party supplies for teenagers and adults can also be found here, so be sure to stop by and have a look before planning your next gig!